1. Dip bread into egg mixture. 2. Place bread in heated frying pan or griddle over medium heat. 4. Remove from pan and top with powdered sugar & syrup. Jon was very surprised and said that he didn’t like it, he LOVED it!!! He wants it every day for breakfast now. (What the heck was I thinking? I just made more work for myself every morning?!?) He had some bacon and fried potatoes along with his new-found breakfast for dinner love. 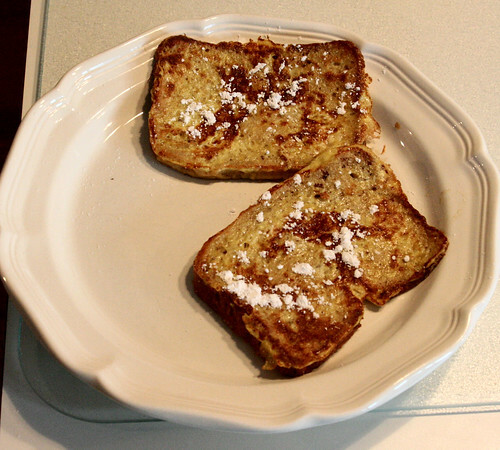 I did make Hannah some French Toast too, but I did hers after Jon’s and used regular bread for her. She saved one of her pieces for breakfast tomorrow. She voted Mommy’s French Toast better than her frozen Eggo Waffle French Toast Sticks (what an honor 😉 ). I had a spinach, bacon & mushroom omelet, toast & butter (Pamela’s), fried potatoes, 1 slice of bacon and some Edy’s Dibs (oops….I missed out on my fruit b/c the darn Edy’s Dibs were calling my name!). On a side note, love that the Dibs are GF. I love the chocolate covered chocolate. They are only 15 calories each, serving size is 28!!!!! HEL-LO!!! I just like to eat a few at a time for a sweet treat.